A couple of weeks ago I attended a series of conferences in Portugal, where I had the chance to meet some of the best people working in the field of participation. It was also an opportunity to talk with a number of Brazilian observers who provided me with more of an insider’s view of how the recent wave of protests in Brazil relates to the state of participatory governance in the country. The Latin community of researchers and practitioners (mainly Italian, Spanish, Portuguese, Brazilian, and French) are some of the best when it comes to participatory design. I was particularly struck by the level of work presented at the Centre for Social Studies of Lisbon, where researchers and scholars focused on the scaling up of participatory governance initiatives—that is, from local to higher levels of government (e.g. state, national). This is a tricky endeavor, as experience shows over and over again that you cannot just replicate local level participatory innovations at other levels. At the risk of stating the obvious, the formula for successful scaling up is far from being discovered. But some people are closer than others. On a totally different note, mobile phones are definitely making their way into participatory budgeting. The coastal city of Cascais deployed an SMS voting system to let citizens decide on the allocation of 1.5 million Euros. The numbers suggest some success: with mobile participation the number of participants jumped from 6,000 (2012 PB) to 24,000 (2013 PB). The municipal administration has also launched a new smart phone app (FixCascais) to enable citizen reporting on problems in the municipality. During the Conference of the International Observatory on Participatory Democracy (IODP), the latest book organized by Nelson Dias was launched. Entitled “Democratic Hope: 25 Years of Participatory Budgeting”, the book brings together texts by more than 40 authors from all the continents, providing an encompassing view of 25 years of PB around the world. I was happy to co-author one of the pieces with Rafael Sampaio. The subject of our article? Technology and participation, of course. The book is currently only available in Portuguese, but hopefully it will soon be translated into English. Nelson Dias has also been doing some interesting research, looking at the development of Portuguese PBs over time and examining what makes some more sustainable than others. The actual impact of citizens’ input on the decision-making process emerges as the determining factor. When it comes to PB, it seems that merely consultative processes are like cigarettes: they stink and lead to early death. 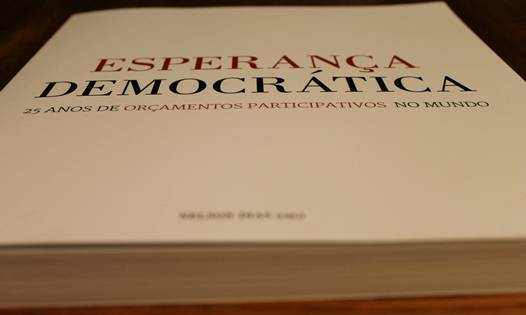 New book organized by Nelson Dias, “Democratic Hope”. If you take a closer look at the recent demonstrations in Brazil you will realize that some of the strongest demands refer to increased citizen participation. In Rio de Janeiro for instance, one of the demands is precisely the implementation of participatory budgeting. The Brazilian Federal Government seems to be willing to boost its support for PB. Rio de Janeiro campaign for Participatory Budgeting. (….) people do not simply wish to vote every four years. They want daily interaction with governments both local and national, and to take part in defining public policies, offering opinions on the decisions that affect them each day. In short, they want to be heard. This creates a tremendous challenge for political leaders. It requires better ways of engagement, via social media, in the workplace and on campuses, reinforcing interaction with workers groups and community leaders, but also with the so-called disorganized sectors, whose desires and needs should be no less respected for lack of organization. During the recent demonstrations in Brazil, approximately 62 percent of the people were informed of the event via Facebook, a much higher rate than TV, which was first source of information to 14 percent of attendees, according to Ibope Institute. Three out of four agitators used social networks to round up support. Even if most governments lag behind, there are some promising experiences. For instance, at the height of the demonstrations, Tarso Genro, the Governor of Rio Grande do Sul held a Google Hangout with citizens to listen to their demands. The number of participants: half a million. Google hangout with 500,000 citizens. Governor Genro then launched an online ideation/ranking process on political reforms. 182,000 votes were cast on over 200 proposals. Among the 10 proposals receiving the most votes? Increased citizen participation in decision-making processes. Pair-wise voting system used on political reform consultation. The Brazilian Institute of Applied Economics in Brazil (IPEA) is doing some interesting research looking at participation in some of the major federal programs in the country. One of the findings debunks the assumption that participatory processes may delay execution. Participatory and non-participatory processes perform equally when it comes to execution. The difference? Participatory processes are more innovative. More on that later. The vitality of the use of social media to foster collective action in Brazil is contrasted by the demands of some segments of society to put an end to the proportional system of representation in the country. This seems, to a certain extent, rather contradictory. And here’s why. Ronaldo Lemos is now officially representing the MIT Media-Lab in Brazil. This is great news. With an amazing track record, Ronaldo is also one of the people behind the Brazilian Internet “Bill of Rights”, the Marco Civil. Fruit of a truly collaborative exercise, the legislation aims to guarantee the civil rights of Internet users in Brazil. While in the US some transparency advocates fear that Snowden’s leaks might have a chilling effect on the transparency agenda, in Brazil the results are somewhat different. The revelation of the NSA’s electronic surveillance of Brazilian officials has led President Dilma Roussef to consider the approval of the Marco Civil by Congress as a top priority for her Government. If approved, the legislation will be a milestone for those in the country working with technology and open government.